Wildwood has two handcrafted timber cabins which overlook the freshwater creek and Daintree World Heritage listed rainforest. 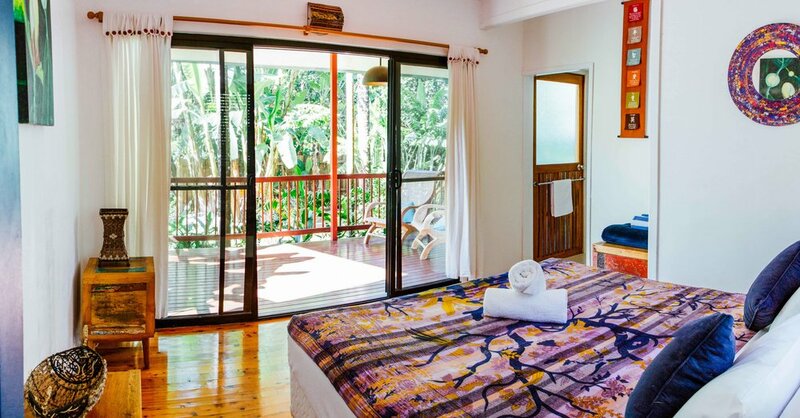 Guests can relax on the verandah listening to the birds, frogs and forest calls while watching the butterflies dance on the rainforest flowers. It’s magic. The cabins are designed to catch the forest breeze and remain cool at night. They are comfortably furnished to a high standard with high lofted ceilings, queen size bed, futon sofa bed, ensuite bathroom with shower, full kitchenette, fan, single ring gas top, bbq, fire pit and large verandah with dining table and chairs. They are fully screened to keep out mosquitoes. The cabins are fully equipped with all cooking equipment and crockery and are well stocked with basic provisions such as salt, pepper,oil, mosquito coils and tea lights. The creek is just 3 metres from the cabin and runs seasonally with the rains. After a downpour there are several swimming holes which guests can enjoy. The cabins are ideal for couples, honeymooners or families with young children. They comfortably accommodate two to three adults or a family of four with young children (under 10).